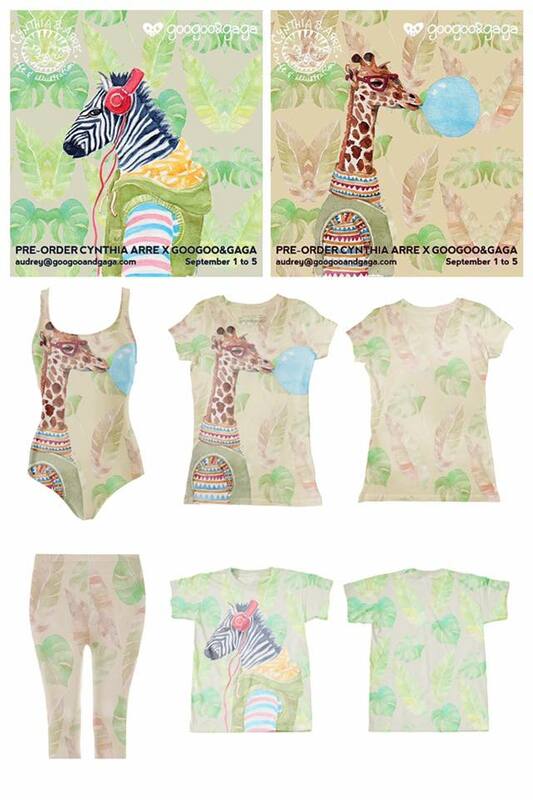 Excited to tell you guys that super cool apparel brand Googoo&Gaga has invited me along with fellow artist Wiji Lacsamana to come up with designs for their 2016 Artist Collection series. This year they’re focusing on watercolor art. 🙂 I’ve always been a fan of Audrey & AJ Dimarucot’s Googoo&Gaga’s quirky designs (and designer AJ has been a friend since the late 90s) so I was happy to be a part of this collaboration. Here are the designs I came up with. They come in all sorts of clothing styles too — onesies, tees, lap t-shirts, t-shirt dresses, leggings, and even swimsuits which is pretty cool, right? The pre-order period is over but I believe you can still place orders through this link or by clicking on the image below. I had a great time working on them — and making illustrations for a brand for a change — and would love to have another opportunity like it again. So if anyone out there reading has an idea for a collaboration, please shoot me a message and let’s see what we can do. To you guys subscribed to this blog (yes, all three of you ;p) I must apologize for the lack of updates and for also being a little impersonal lately. I know I’ve mostly been posting ads for workshops or new products in my store and the occasional product review. Where have all my musings and indirect confessions of inadequacy gone, right? Well, here goes. I often find myself wondering about what I’m really doing. Shouldn’t I busy myself with making money instead of art? Obviously I can earn more as a designer since that’s what I do professionally but I have stubbornly been focusing more on improving my skills at drawing rather than pursuing what I already know how to do. If there’s something I’ve clocked in over 10,000 of hours on, it’s graphic design. But here I am trying to get into the world of illustration, unknown territory. Perhaps it’s because I almost had it — I was on that route a long time ago. I used to paint everyday. I drew portraits of my idols (River Phoenix, Ralph Macchio, and, okay, the Menudo guys) in charcoal back in high school. The late Jose Joya, a *National Artist*, gave me the honor of being a recipient of his award in 1988. And then I slipped down the rabbit hole of commercial work and all traces of my previous budding illustrator self disappeared. Around 10 years ago, a friend / fellow artist I greatly admired complimented my portfolio but then asked to see my personal work. My mind went blank. I asked him sheepishly, “what do you mean, ‘personal work’?” He said, “you know, art you’ve done just for fun.” And so it struck me that I had absolutely NONE to show. Everything was for a client. Even the band stuff. I had fun working on them, yes, but they weren’t for *me*. BUT. 2014 happened and I’m back on that track or so I’d like to think. I have a long way to go still but whenever I feel like giving up and going back on familiar ground, I scroll down my Instagram, look at the body of *personal work* I’ve amassed, and keep soldering on. Hello! Is anyone still reading this? I’ve been wanting to revive this blog but I didn’t know what to write about… or if what I will write will interest readers, even if there are just two or three of you now. Or none? Eep! *takes deep breath* Aaanyway. I’ve noticed that blogs these days seem to be more focused on making money, unlike in the early days when everyone was doing it to share thoughts with a tight-knit community. I miss those times but I guess there’s Facebook now for that kind of thing. So maybe I’ll start with what kept me busy when I wasn’t here. Ironically, I was also blogging –> over there. What started out as a small hobby exploded into something bigger than I expected. At least I was still making art in the form of invitations but I missed having a venue for personal self-expression. So then I started making little illustrations that I turned into patterns which I sold online on various surfaces, from iPhone covers to fabric. And if you’ve seen my Instagram feed, you’ll notice that I’ve recently been leaning towards analog design. I rescued my Print Gocco from unuse1 and went crazy using up almost all of my (ahem, hoarded) screens and bulbs. Sadly though, since the Gocco got discontinued, supplies are now hard to come by — not to mention really expensive if you’re lucky enough to find some on eBay. 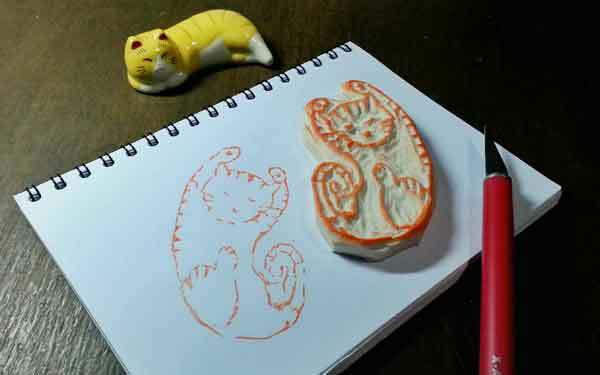 Which is why I’ve been looking for other ways to get my art printed and then I thought, why not try rubber stamping? We did this in school with erasers before but I haven’t done it in years. 1. I need better sculpting tools. I ordered a Speedball lino cutter from Amazon but I’ll have to wait for a few more weeks for it. 2. The cuts should be shallow. I was making deep cuts at first but then I noticed that it took a lot of effort to turn the blade around which resulted in jagged lines. 3. Practicing can really make a difference. Comparing the stamps I made last week with this week’s batch, I would say there’s an improvement. Here’s one I made today. The lines are still crude but I’m glad I managed to carve out all those little stripes without giving up. Stay tuned for more of my adventures in rubber stamp carving. Meanwhile, I also wanted to tell you that I spiffied up the surroundings in case you hadn’t noticed. 🙂 A portfolio of my newer stuff is now integrated into the site plus I wrote a novel for the about me page lol. So there, I started blogging here again — no turning back now. More soon!